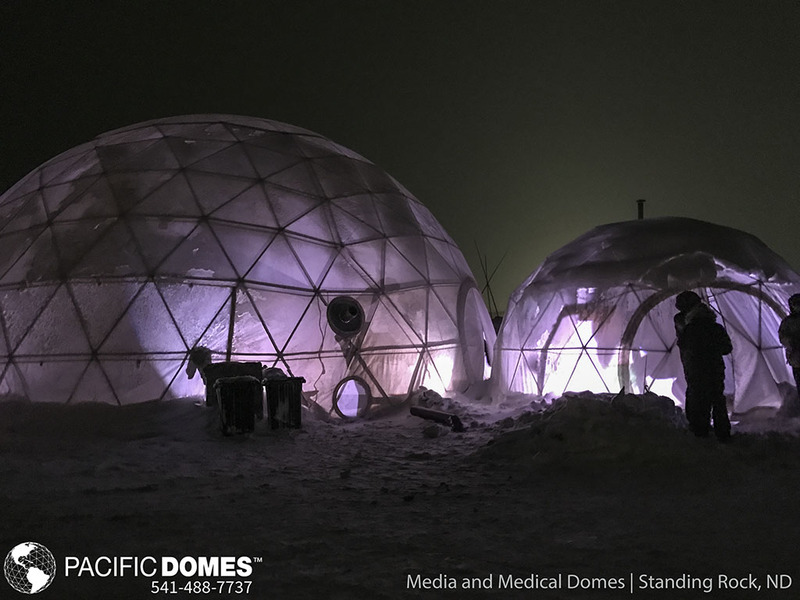 Standing Rock Shows the strength and durability of our shelter domes. 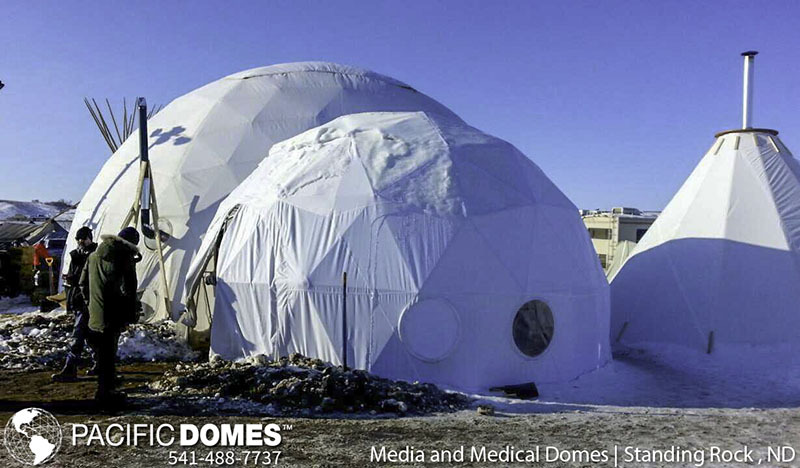 Portable relief domes from Pacific Domes can survive the harshest weather on the planet. Contact us for your portable shelter needs today. 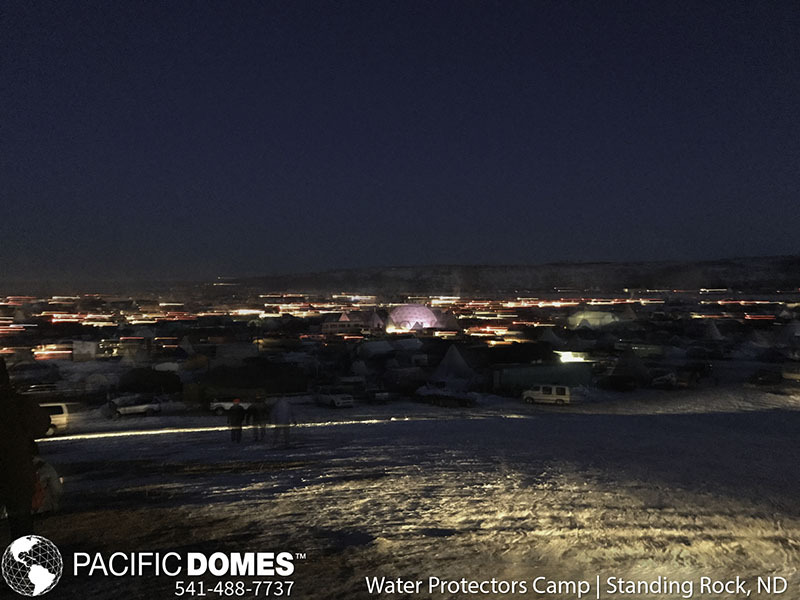 “There are constant reports of the geodesic dome being the only structure left standing after a blizzard, hurricane or earthquake.” — Pacific Domes Inc.
Geodome eco-tent shelters are providing relief from this year’s harsh Dakota winter to Water Protectors at Standing Rock. Shelter tents combine the geometry of design genius, R. Buckminster Fuller, with the geo-engineered strength of steel frames and tensile strength UV covers to handle extreme wind and snow loads. Portable geodome eco-houses can be found at many remote locations because they are suited to all types of terrains, are fully deployable and can be erected in hours with a few hand ratcheting tools. Geodomes have been built all around the world in different climates and temperatures, ensuring a light eco-footprint. 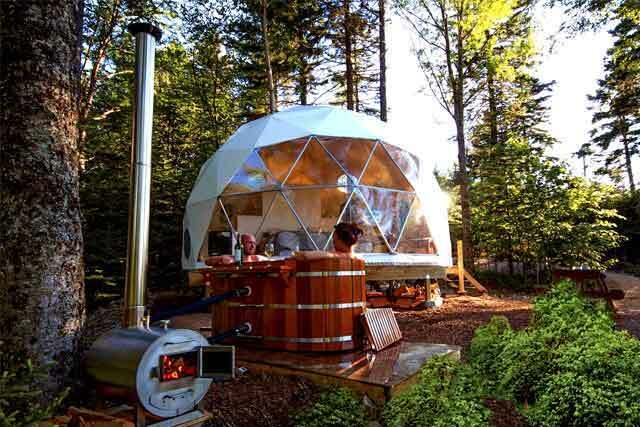 Geodome Shelters have proven to be the most efficient aerodynamic human shelter one can find because ambient air and energy circulate without hindrance, thus enabling heating and cooling to occur naturally. Durable UV resistant, flame-proof, waterproof geodome tent covers naturally illuminate the interior. A geodome’s interior offers limitless possibilities for creativity, as the circular design encloses the largest volume of interior space with the least amount of surface area. When the geodome’s diameter is doubled, it quadruples its square footage and produces eight times the volume, thus saving on materials and cost. Geodomes support electrical and sound-lighting equipment; and, accommodate heating and cooling systems. Multiple geodomes may be connected to create an entire complex. Geodome eco-tent shelters are the perfect structure for many relief functions and lend themselves well to innovative layouts, providing economical housing and useful spaces for medical treatment and other facilities. Relief shelters can be set up on site as a base of operations; and, because they are considered temporary shelters, this means they can be easily transported to the location, and can be just as easily taken down when no longer needed. Buckminster Fuller made it his mission in life to solve humanity’s need for environmentally efficient shelter. In honor of Fuller’s contribution to sustainable geodesic design, the renovated, ‘Dymaxion House’ was opened to the public in 2001, as a model towards building a positive future. Walking the path of ‘Bucky’ Fullers vision to create sustainable communities, Pacific Domes USA, has pioneered eco-living geodome shelters since 1980. The award-winning manufacturing company, based in Southern Oregon, proudly offers prefabricated geodome shelter tents for sale or rent. Browsing Pacific Domes gallery of Shelter Tents is the first step towards exploring the benefits and versatility of geodesic domes as the strongest, portable structure known to man.